All of the Treshnish Islands are now uninhabited, but evidence of former settlers abound. Iron Age duns, remains of castles from Viking times (the 9th to the 13th centuries) and more recent ‘black houses’ prove the existence of communities surviving on these mostly barren, inhospitable islands despite there being no safe landing places. The name ‘Lunga’ comes from the Norse word for ‘longship’. 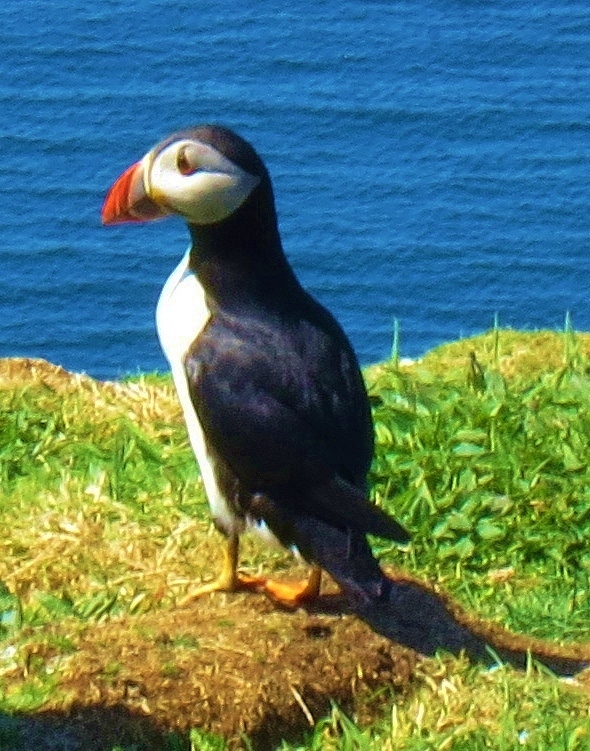 After visiting Lunga recently, I think of it ‘Puffin Paradise’. 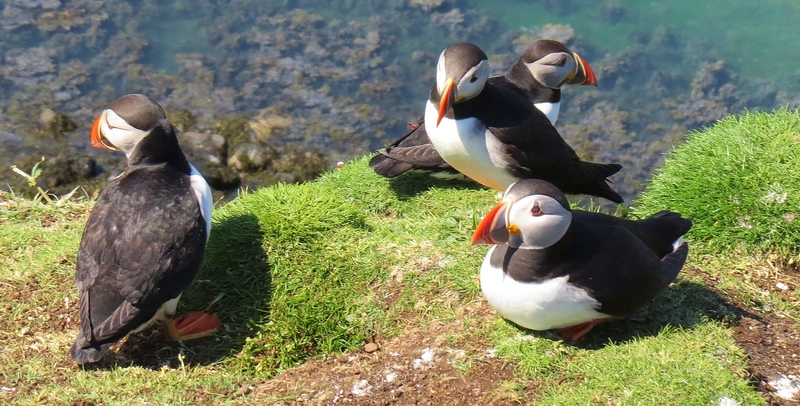 From mid-May to mid-August it is home to hundreds of nesting puffins who make their underground dwellings in burrows along the cliff edge, with a few settling in an ‘annex’ a short distance inland. Even without the company of these delightful, personality packed, feathered visitors, this totally unspoiled island is well worth a visit. The bright, showy colours on the beaks of these charming birds are only apparent during breeding season. For the rest if the year they are a dull orange. 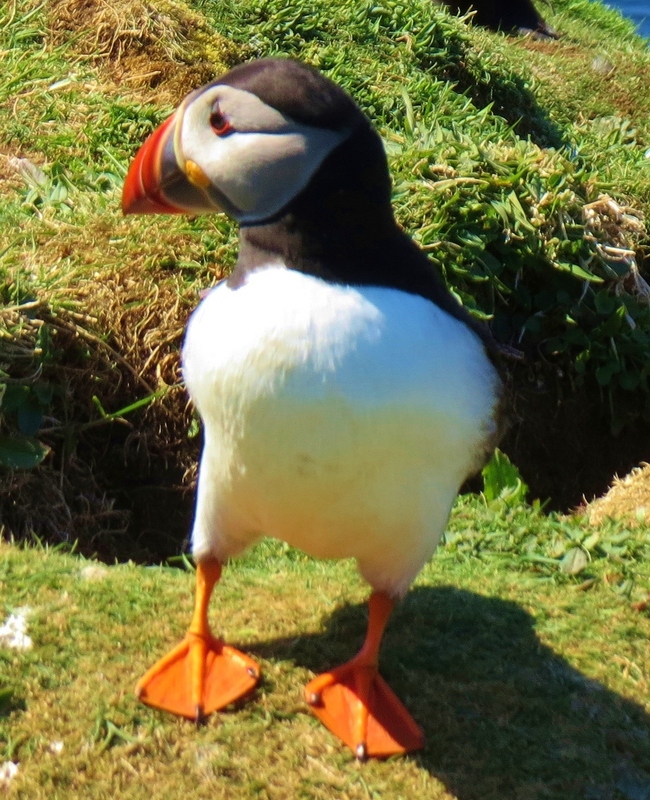 Puffins live out at sea for most of the year but come ashore in breeding season which lasts from May to August. They live and lay their eggs in burrows on top of cliffs. The collection of burrows, which can run into the hundreds, is called a colony. They eat small eels, abundant in the surrounding sea. Harp Rock, separated from Lunga by a narrow ‘gut’ or tidal strait, is, in winter, home to many barnacle geese. One of the most endearing things about these hardy, little sea birds is their tolerance of humans. While this is probably not true in other areas, on Lunga and surrounding islands, they have, over time, learned that, with humans around, predators will stay away. While they are not so tame as to allow one to touch them or get into their ‘personal space’, they do allow people to get within a couple of feet. It is usual to see tourists sitting enjoying picnic lunches within arms length of these delightful summer visitors who carry on with their activities as normal. Puffins mate for life and return to the same burrow every year. 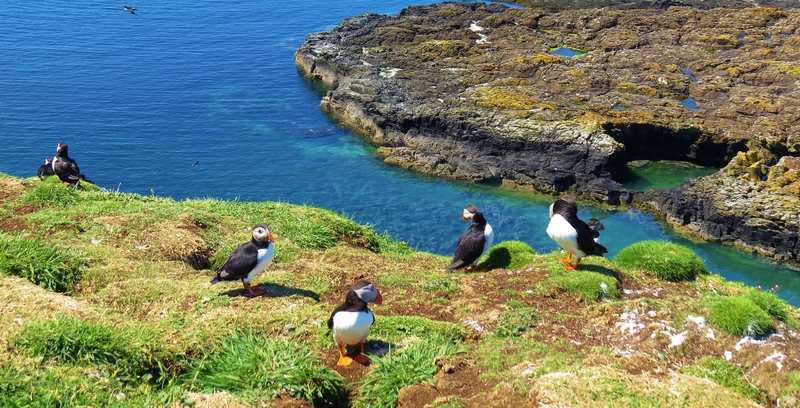 They can be found on other islands in the Sea Kingdom, including Staffa, but the idylic setting and vast variety of other migrant birds that call Lunga home, for at least part of the year, make this little isle THE best place in the region to meet and greet them. Many other avian varieties nest on Lunga during Spring and Summer including storm petrels; kittiwakes; Manx shearwaters and razorbills. A guillimot colony is to be found a short distance from that of the puffins. This magical place truly is as enchanting as that place ‘over the rainbow’ which so universally captivates people. Lunga has been designated ‘a place of special scientific interest’, partly because of the many rare or endangered varieties of plant life native to the island. 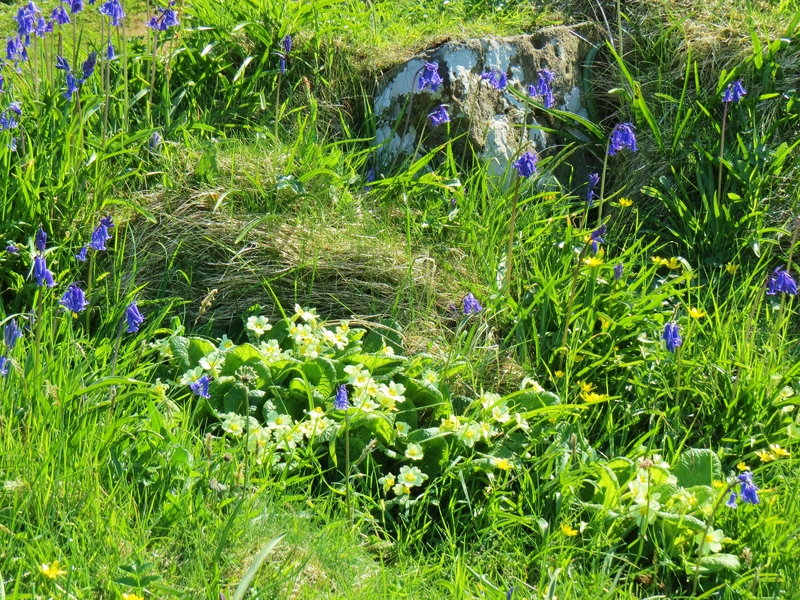 These include primroses; birdsfoot; trefoil; orchids; sea pinks; sea thrift; yellow flags; tormentil and oyster plant. Tour boat with pontoon arriving at rock field. There is no safe landing place on any of the Tresnish Islands. On Lunga, a large rock field is the only possible place of access. Even this is frought with difficulty. Boats must be tied to a pontoon and floated in to land. When the tide is high, as in the picture above, only dry rocks are exposed and passengers, if they have good balance, can make it across the rock field without too much trouble, but as soon as the tide turns, black volcanic basalt which, when wet, is slippery as ice and treacherous to even the surest footed, along with abundant seaweed, makes alighting a hazardous experience. Staffa Tours excursion boat off Lunga. Regardless of the challenges in getting there, visiting this truly enchanting little isle is an unforgettable experience and a rare chance to spend time in a place way over the rainbow.